Traffic-free cycleways or very quiet roads. Generally easy to follow, but the cycleways were not well signposted. Coming out of the Venzone by the Porta San Giovanni, there is a very short section of about 50 metres on the SS13 before you turn off to the right, and then go under­neath the railway line. Continue, following the signs for Pioverno. The road takes you over the river. When you come into the village turn right following the signs for Bordano on the Via Passerella. (You'll see signs for the FVG1 (Ciclovia Alpe-Adria Radweg) going the other way). At the next junction, turn right onto the Via Cavazzo Carnico. This continues, initially through meadows, and then woodland, following the course of the Tagliamento river — although you don't actually see very much of the river. The road is bliss­fully quiet and has an excellent tarmac surface. Officially it is an itinerario ciclope­donale which means there are no restric­tions on cars using it, but although it's not officially a cycleway in name, it's very much a cycleway in practice. And a real gem at that. The 'cycleway' takes you to a junction with the SR 512. This is the main road but was very quiet. You also have the option of turning off to the right and following a section of track for a kilometre to the village of Cavazzo Carnico. Coming out of the village follow the Via Roma look for the signs for Tolmezzo. The Via Roma takes you to a junction with the main road. Turn right, onto a cycleway which runs beside the road. The cycleway then diverges from the road, and there's a wonder­fully peaceful section through woodland. The tarmac surface looked as if it has been very recently laid. The cycleway climbs and then descends again to rejoin the road. If you're in a hurry, you may prefer to take the more direct option on the SR512. The cycleway continues to shadow the road, more or less, for 1.6 kilometres before you have to rejoin the road and cross the Tagliamento into Tolmezzo. 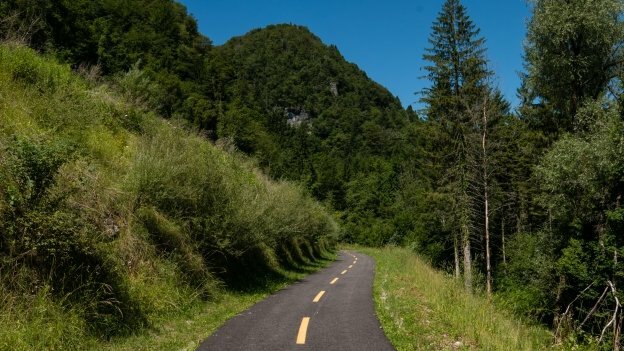 The cycleway skirts round the outskirts of Tolmezzo running alongside the main road (and at one point running under­neath it). It then crosses over a river, this time the Torrente But. On the other side of the river, as you come into the village of Caneva on the other side of the river you need to make a sharp right turn onto a narrow lane. 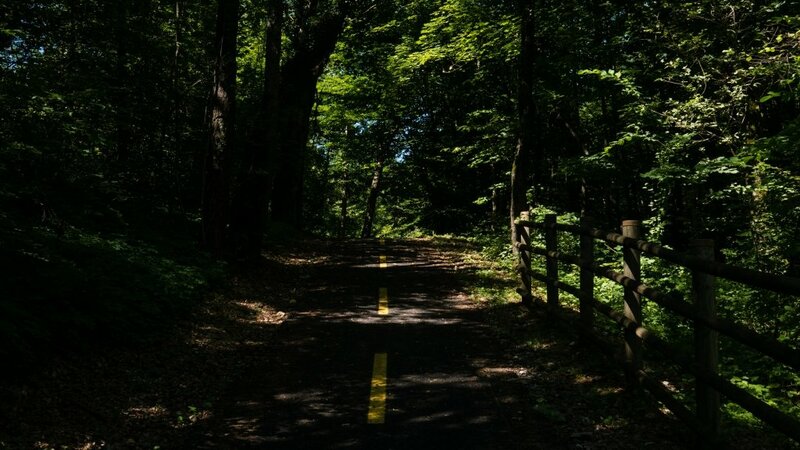 You can see some yellow paint on the road, but otherwise, there is no indic­ation or sign. On the way to Villa Santina, you come out onto a stretch of appar­ently-deserted road which runs beside the main strada statale. On your left, you will see the entrance to a cycleway with some red u-shaped barriers. Don't put off by the initial section on compacted aggregate (although very very smooth) that leads to a ford over a river (normally dry in Summer) that has been paved with stones, once you get past these, the cycleway is smooth, newly-laid tarmac. The cycleway continues along what looks like the old railway line between Tolmezzo and Villa Santina until you come to an avenue of trees, where you turn left. The avenue of trees runs beside a massive great pipe. From here you continue to the village of Invillino and turn left at the war memorial. On the hill above the route is Pieve di Santa Maria Maddalena. The church itself was built in the 11th century, although there had been a castle on the site that dates back to the 5th century. A little further on, you come to a junction with a bridge on the left, and on the river bank by the bridge a little church Santuario Madonna del Ponte (Sanctuary of the Madonna of the Bridge). There's also a track that leads to the Cuel di Cjucie (Col di Zuc) — where there are the remains of an early-Christian basilica dating back to the 5th century. You can still see the well-preserved mosaic floor. The church is thought to have been one of the main religious centres in the area. It was destroyed in the early 7th century. The map shows a museum and an archae­olo­gical site on the other side of the river. I haven't been able to find any inform­ation about them. Ther's also a waterfall, the Cascata Plera. The cycleway skirts around Villa Santina itself, but it's easy to get to the town centre for something to eat or drink. It goes under a main road (this time the SR52) before reaching a ford across a (dry) riverbed (the Rio Moia). The ford itself is fairly rough, but the tarmac resumes immedi­ately after­wards. Seven hundred metres or so further on, you go under a road, and then the cycleway bears right, heading for the strada regionale. When you get to the main road, you have some options. The cycleway makes a sharp left and continues beside the river for almost another couple of kilometres. This is then followed by another couple of kilometres on a quiet country road. There's then a section of track that takes you for another 4 kilometres or so into Ovaro. If you'd rather avoid this section, you can take the main road, but a better altern­ative would be to cross over the river and take the road on the other side that leads to Raveo and continues towards from there to Luincis following river (the Torrente Degano). The second option bypasses Ovaro, but there are a couple of points where you can cross back over the river and reach the town. Ovaro is the start point for the Monte Zoncolan climb. 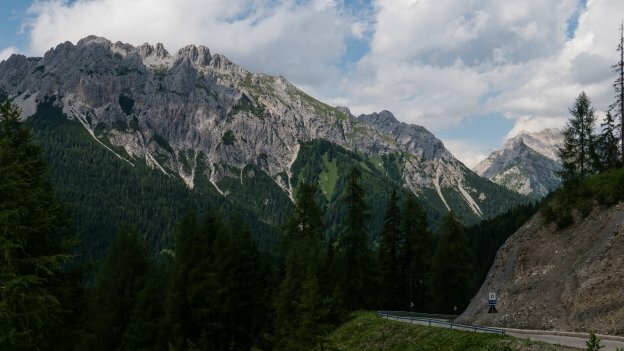 It was first included in the Giro d'Italia as recently 2003 but has become one of the Giro's most famous climbs (or 'notorious', or 'feared' depending on your point of view). It has now become a regular feature of the tour (five times between 2003 and 2017, with another ascent planned for the 2018 tour). The climb from Ovaro is 10.1 kilometres, with an elevation gain of 1,210 metres. The average gradient is 11.9% with a maximum gradient of 22%. The toughest section of the climb has an average gradient of 15% for 6 kilometres. Look out, on your right-hand side for the Chiesa di San Martino where there are the remains of another early-Christian complex> Inside the present-day church, a glass floor lets you see the remains of the fifth-century church. The road takes you through the village of Luincis (Luvincis) and then to a junction with a strada regionale (the SR465). 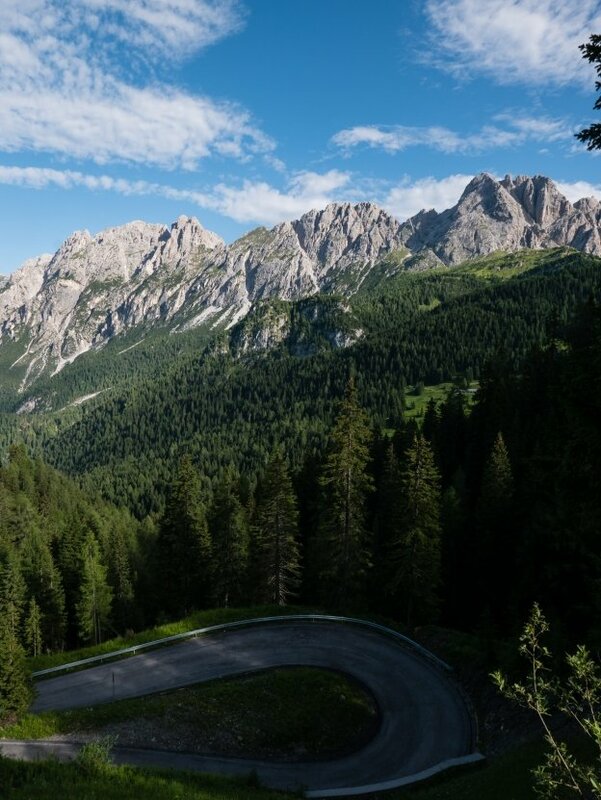 This road takes you into the Val Pesarina. Turn left, following the signs for Prato Carnico and Pesariis. The ride takes you through some lovely Friulian villages. The highlight is the village of Pesariis. Pesariis is an attractive and inter­esting Friulian village, that is well worth a stop in its own right, but what makes it partic­u­larly inter­esting are the display of sundials and clocks around the village. 'Clocks' isn't really the right word though, as there's a range of time-keeping devices that go well beyond what we would think of as a clock. The first 'clock' is on your left as you come into the village: it's a series of 12 glass containers that fill with water at a constant rate. Each container takes an hour to fill, so that at 10:00 ten containers are full. At 12:00 the process starts all over again. Water has been used to keep time for more than two millennia, and there are three other water-clocks in the village. Another ingenious device uses water dropping into a pivoting container to power the mechanism that turns the hands of a clock. The sundials are equally intriguing. Almost next door to the Museo dell'Orologeria, there's a meridiana that has two sets of grada­tions — the two sets are for the different systems that were in use on different sides of the Alps. Look out for the giant flip-clock - a digital clock where the number are painted on the surface of flaps on an axle and the time changes by flipping the flaps. The system was invented by the Fratelli Solari in the 1930s and the same basic idea was developed for train and airport departure boards. The Udine branch of the firm went on to sell them around the world, and the devices were up until pretty recently until electronic displays took over. There's a Solari flip-clock in New York's Museum of Modern Art, the Cifra 3. (For more pictures go to italianways.com). And while we're on the subject of digital clocks, you can see another Solari design exper­iment from the 1930s: the Orologio a scacchiera chess­board clock. The clock uses a matrix of metal plates, red on one side and white on the other, to display the time. The same approach is used in modern digital displays. If you're wondering, the Fratelli Solari are still have a small factory in Pesariis (the firm is now owned by Pirelli). The route crosses into the Veneto region. A kilometre or so later on you come to a T-junction when you turn left onto the SP 619 following the signs for the Sella di Ciampigotto. The climb through the Val Pesarina is, a relat­ively long one, although it isn't steep — an altitude gain of 1200 metres in 30 kilometres. As a lot of it is in woodland, with not much to see, apart from trees, you may be starting to think 'are we nearly there yet?' But then, you turn the corner, and you get the first glimpse of the Veneto Dolomites. You can see them in pretty much whichever direction you could look, shimmering in the afternoon sun. Hopefully, if they aren't shrouded in clouds. 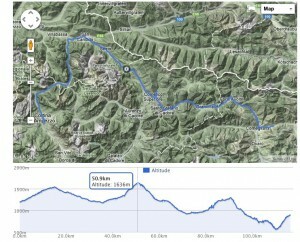 As you come within the last hundred 50 (vertical) metres of the top, the gradient also seems to ease up. Trees start to thin out just hear the sound of cowbells with cows grazing in their summer pastures. The top of the climb brings you the Sella di Razza (1760m) where there's a malga (summer dairy). You continue crossing a high plateau (the Altopiano di Razzo). A little way further on the road starts to climb again to make the final climb Sella Ciampigotto (Zima Cianpigoto) — altitude 1790m. Views are simply amazing: this is what makes that all that climbing worth­while. Welcome to the Dolomites. OK, strictly speaking, the mountains on your right stretching out before you are the Alpi Carniche (Karnische Alpen), running along the border between Italy and Austria, but beyond them are the Lienzer Dolomiten. The Dolomiti Friulane are to the left, but you can't really see much of them. At the sella (pass) there's a rifugio with a bar and restaurant, and another bar-ristorante a little further along the road. From the Sella di Ciampigotto you start the descent down into the Cadore. The road descends through a series of hairpins. This section feels like it has been hacked out of the hillside. It's a section to take slowly and savour: each bend in the road offering a new perspective, a new dramatic vista. After the initial section fairly steep and twisting section there's then a long cruising section as you descend through woodland to the village of Laggio di Cadore (944m). If you have the time, it's defin­itely worth making the two-kilometre detour to Vigo di Cadore to see the church of Sant'Orsola (St Ursula). Inside the church, there are a series of frescoes depicting the legend of the saint. Painted by an unknown artist in the 15th century they are, without doubt, a master­piece. They have been beauti­fully restored so that you can appre­ciate the rich colours. The legend is that St Ursula was the daughter of a British king who, according to the legend, went on a pilgrimage with eleven thousand female companions, and they were massacred by the Huns who were besieging Cologne. 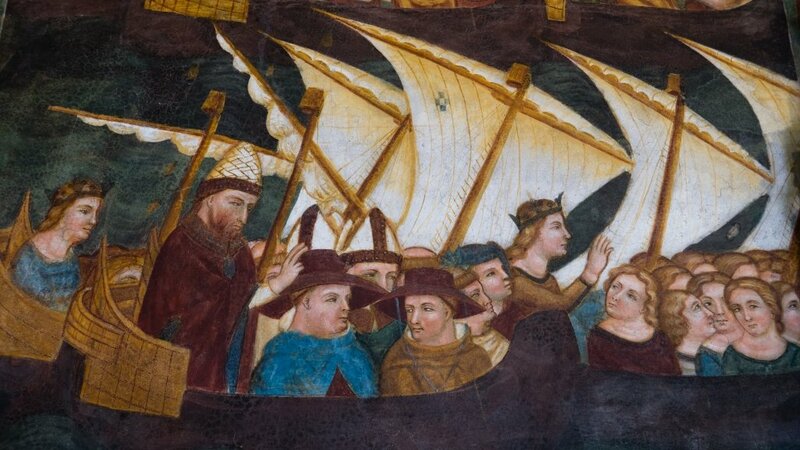 The cult of Saint Ursula and the 11,000 martyrs was widespread in medieval Europe, and it's said that Columbus named the Virgin Islands after them. During July and August, the church is open every day except Mondays between 10 and 12 and between 16:30 and 18:30. The road from Laggio (the SP 619) comes to an end at the junction with the SS52. From here you have to follow the main road as it heads for Auronzo. The traffic tends to come in flurries as vehicles bunch up behind the slowest moving car. This makes the traffic feel more intense than it is. At a certain point, the SS 52 splits off and heads for the pass at Comelico. Shortly after the junction, you come into Auronzo di Cadore. 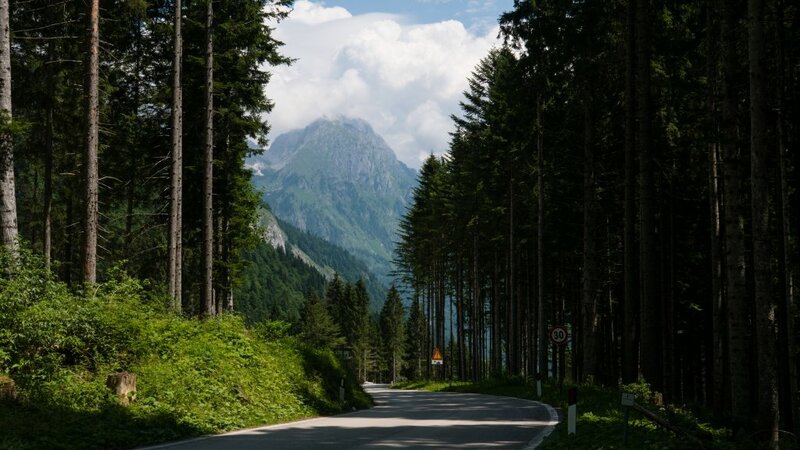 You could continue to Auronzo di Cadore direct from Vigo – but this involves a longer ride on the main road, retracing your steps to Laggio di Cadore is a little longer, but means less time on the main road. On the bank of the Lago di Santa Caterina Auronzo is the main tourist centre for the area. Before you get into Auronzo itself, stop and admire the view from the dam, with the lake set against the backdrop of the Dolomites and, in the distance, the Tre Cime di Laveredo (Drei Zinnen). the Camping&Caravan Zoncolan (booking/​availability enquiry is a small site near Ovaro. the OSM maps show a campsite (Camping La Fuina) between Osais and Pesariis, but I haven't been able to find any inform­ation about it. I suspect that it is no longer operating. 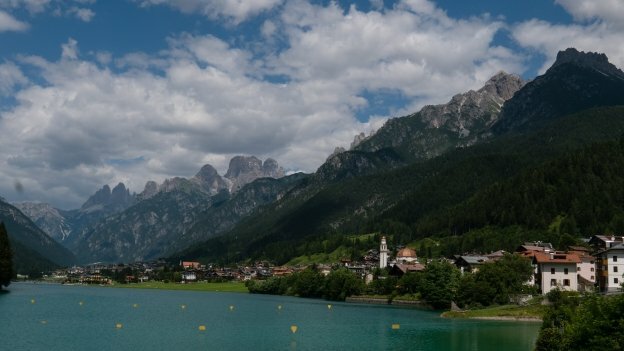 The Camping Europa in Auronzo, is an all-year site, that seems to have a lot of permanent lets, but has an area for tents with at least 20 gener­ously -sized pitches. There are no bike shops on this section of the route. I had a good lunch at the Albergo Cimenti in Villa Santina — the staff were even kind enough to let me wheel my bike through the restaurant so that I could leave it on their terrace. auronzomisurina.it is the tourist inform­ation site for Auronzo di Cadore and Misurina.